It appears as though my lower back pain may be the result of sleeping in a wrong position. I have been sleeping with my bed in the bench-seat configuration instead of the bed configuration. Last nite my bed was in the bed configuration and I slept sooooo comfortably! This morning my lower back pain is gone! Box Van is Afternoon Camped on Shelter Island. 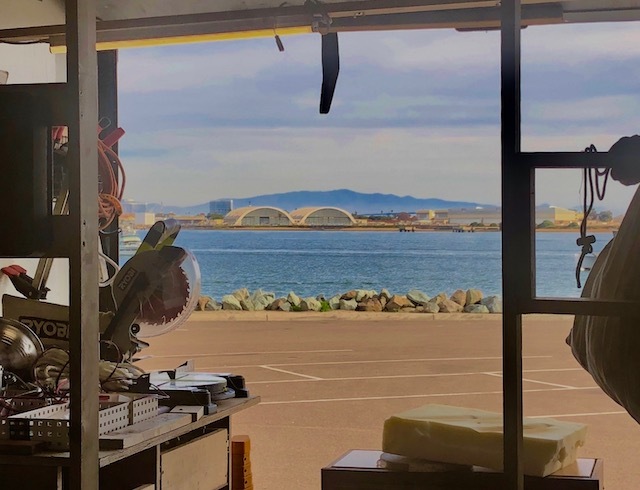 A view of Coronado Island's aircraft hangers may be seen thru the open sliding back door. Hi George... glad you concluded a good bed is so important. Getting a good nights sleep is important as we get older. Please check the Toby Keith YouTube "Don't let the old man in." Especially the line about "how old would you be if you didn't know your birth date!" Getting help is ok. It is not a reflection on age. A 40 y/o would likely need help to set a cabinet in place. I think your friend John would agree. Looking forward to your blog over the next many, many years. Btw, at 80, my wife and I are considering driving our 40ft rv and truck toad to Alaska from Michigan this summer. Let the old man know he has no place in your life either! Ernie I have no words for how much I love your comment and your spirit! George that's a million dollar view right there. You're creating fabulous life every day - teaching so many things, especially How To Be. I love your knowledge and that you share it. Too, I love your spirit! Glad to hear your back is feeling better. George . . . Don't let physical limitations get you down. What you describe -- having to get help to lift the cabinets -- is the kind of thing a lot of us women have had to do all our lives. It's humbling for a man, but not something that should necessarily hold you back from doing what you want. That is one of your best pictures! Chop saw in the foreground, aircraft hanger in the background. I'm still following after all these years, although I seldom comment. You have a lot of people who care about you and if you need help, I'm sure it will be provided. Hey George, maybe you should take a day or two to rest your soul and body... Might want to consider going to a nice hotel with a nice bath, hot tub, and sauna... Could do wonders. Pretty sure holding up a cabinet and securing it to the wall is never easily accomplished alone. I wish I could hold those cabinets up for you, while you screwed them in.... I bet a reader who is in the area would be glad to help. Thank you sooooo much for your wishful offer! Somehow those cabinets will be installed. I just got to be patient. George, I have gotten a "cabinet lift" from a rental store for this purpose. Easy way to do it when I don't have help.